Plan the Thanksgiving menu, the cleaning, the decorating – basically anything in my power.� This includes letting others help.� Allowing guests to bring a dish takes one thing off my very full plate, frees up the oven space, and lets everyone feel like they are apart of the festivities. Giving yourself the gift of housekeepers the week before an event is also a sanity saver.� Otherwise, I suggest a cleaning schedule that saves the vacuuming and mopping for last. Most sides and desserts can be made in advance of the big day.� Have you ever noticed how good leftovers are?� Yeah, that basically just gives you permission to make everything ahead.� It will taste better! What gets done gets done. What doesn’t -�doesn’t. There. That’s it.� I’ll do my best until I’m done or tired or turning into a crazy person.� Then I will stop because what I will have done will be enough and my family likes me better when I am nice and sane.� They don’t really care if everyone gets a hand-lettered place card. 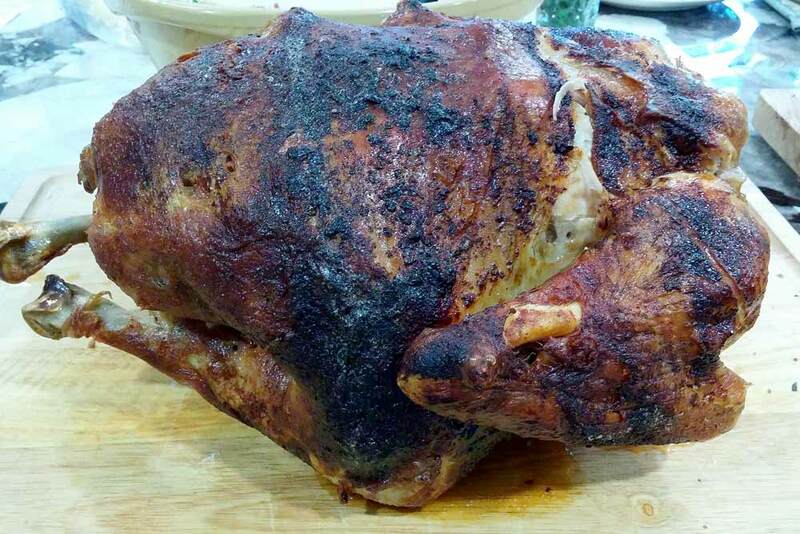 Rotisserie Turkey: If you have never rotisseried a turkey this is definitely something you should do! Simple Dressing (a.k.a. stuffing when you don’t shove it up a bird’s backside):�Normally I do an awesome cornbread dressing with chestnuts and cherries and deliciousness.� But, in an effort to streamline my Turkey Day I will be giving the Epicurious “Simple is Best” Dressing a go.� It definitely is simpler than baking my own cornbread and then turning it into croutons. Pan Gravy:�Pan gravy is an art, following a recipe for it is hard. Read some recipes, watch some videos (thekitchn.com has a nice tutorial), but in the end, you�re going to have to rely on your senses�smell it, taste it, watch it.� In general, for two cups of gravy, you will need 1/4 cup fat (add butter or oil if you don�t have enough), 1/4 cup of flour, and 2 cups pan drippings combined with stock.� To kick it up add salt and pepper to taste and a tablespoon of soy sauce. Crockpot Green Bean Casserole: My guests are bringing these but if you are responsible I love the idea of doing these is a crockpot. Again saving that precious oven space is paramount.� This is the recipe I would try this year, with the fresh green beans option. This recipe calls for cheese. If it is against your Thanksgiving morals to put cheese in the green beans then you can definitely just omit it.� The rest of the recipe is quite traditional. Praline Sweet Potatoes: This year one of my lovely guests will be bringing this dish, but this recipe is one I have made for years and is wonderful! 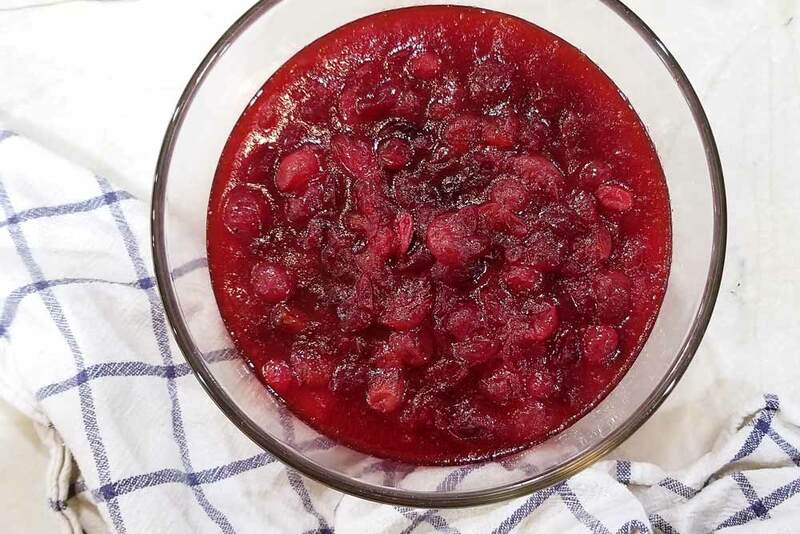 Cherry Pie: Use the filling from this recipe but you can substitute canned sour pitted cherries (in water and drained) for fresh�it is way cheaper and easier!� But, definitely add more cherries, at least 3 cups. I prefer this pie crust recipe�(that says explicitly how to freeze it) and it also makes a bit more. I like having more to work with! Pumpkin Pie�with Whipped Cream:�See side of the can, Libby�s has pretty much nailed this one.� One trick for a smooth and creamy pie is to run your pumpkin puree through a food processor. Fresh whipped cream is my favorite but if you run out of time Cool Whip is a crowd-pleasing option. This whipped cream won’t melt so you can make it a little in advance. Decorate & Plan: Set up your table and figure out what furniture, flatware, serveware, etc. you are missing or need.� Arrange to get or borrow those ASAP. Shop: Groceries – this is a great week to grab some frozen pizzas and ready-to-eat meals, too! Praline Sweet Potatoes (doubled) -�Peel and boil sweet potatoes, mash and blend recipe up to the part where you cook and prepare the topping, cover and refrigerate.� Prepare the topping but leave store it in an airtight container. Crumble on top before you bake on Thanksgiving day. Whipped Cream (doubled) – this should take less than ten minutes so I like to make it fresh after dinner.� But, it could be made earlier in the day as well, this recipe will stay stable for several hours. Get a printable list here.